Something you cannot fail to have noticed when in any health food shop, supermarket, pharmacy and indeed even browsing the pages of fitness magazines and health accounts on Instagram is the vast array of supplements both available to us and seemingly taken by many people pursuing a healthy, fit lifestyle. But with such a phenomenal (and quite frankly confusing) amount of choice when it comes to vitamins, nutrients, and more specific lifestyle support supplements it can be hard to choose not only what’s right, but also what’s safe for you. So when I came across Inner Me “Nutrition Tailored for You” I was curious to find out what made their range of vitamins and supplements different from the myriad of others available to us. But why supplement in the first place? If we eat well and exercise aren’t we doing enough for our bodies to keep them healthy? Yes and No. If you think back to our prehistoric ancestors, of course they didn’t need to worry about whether they were getting a balanced diet and therefore the correct balance of nutrients. They ate what they caught and killed and what grew from the land and coughs, colds, flu and fatigue didn’t bother them – largely because they were doing what humans were programmed to do – be active in the pursuit of our food, eat only when we were hungry (and able to) and consume food in its purest state. Fast forward several thousand years and even those of us with clean/paleo/healthy diets are still consuming chemicals that didn’t even exist 50 let alone 50,000 years ago. Every day we flood our system with not only preservatives and pesticides from the food we eat, but our skin absorbs even more chemicals from our toiletries and cosmetics, we breathe polluted air – all of this on top of being largely sedentary in our everyday lifestyle (compared to our ancient cousins who didn’t even know what a chair was, let alone sat in their car or on a train to get to work and then slouched over a computer all day). All of these factors (and more) contribute to our bodies not always functioning as optimally as they could, and even despite our best efforts to eat well we all have times when perfection isn’t possible when it comes to what’s on our plate – grabbing food on the run, eating out, drinking alcohol, enjoying that slice of cake at our bestie’s birthday…. there are just some times when we might need a little nutritional support to ensure we are doing the very best we can to support our already stressed and somewhat out of kilter systems. Which is where supplements come in. I for one believe in getting nutrition from food wherever possible, but as above know that it really always isn’t easy or indeed possible to give my body exactly what it needs on a daily basis to keep it functioning at its peak. Not to mention other external factors – for me personally living an extremely active life, working long hours and not always sleeping well, and coming into contact with sweaty people every single day means that I am exposed to more germs than most and as a result like to have what I call an “insurance policy” when it comes to my nutrition – for me this is supplements. But what exactly do I need? Over the years I have experimented with many different brands, formulas and combinations when it comes to vitamins and nutrients. Some have left me feeling amazing, some have had little effect at all and some have ended up upsetting my stomach when taken in the wrong way. So one of the things I LOVE about Inner Me is that they have already done the research into what our bodies need at a certain age, and put together combinations that are simple but proven to work. There are packs of “Essential Three” that is backed by worldwide nutritional research as being the supplements that could benefit all of us, as well as packs for people in their, 20s, 30s and 40s and even 50plus. I have been taking the 30s and 40s combination for almost a month now and genuinely feel fantastic as a result. One of the other downsides about supplements is that they can also be a pain when travelling or on the go – carrying pill bottles in my handbag or measuring out exact quantities to cover me for holidays is not convenient, not to mention it can easily be forgotten. 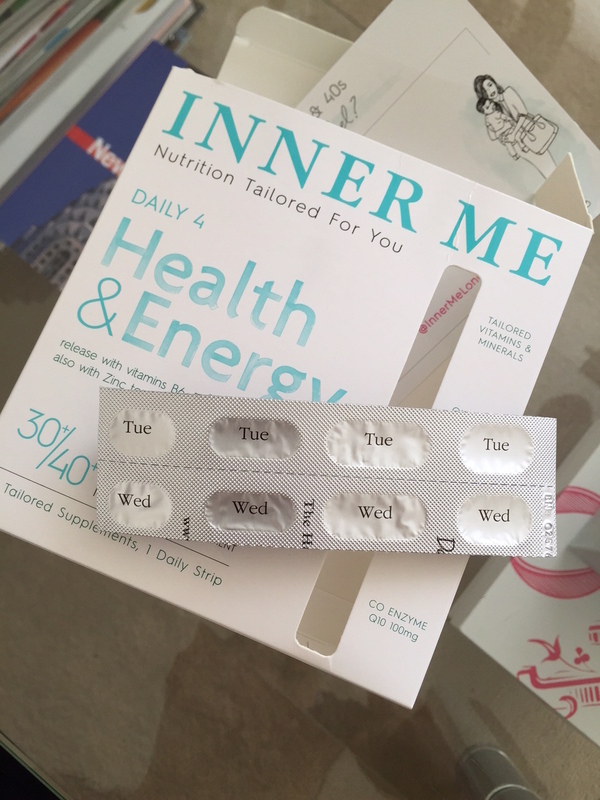 So another benefit of about Inner Me is their “Daily Strip” concept – my pills come in strips of 4, clearly marked day by day so that if I am on the go or travelling or even in a rush before breakfast I can literally “tear and go” and have my daily supplement needs with me in a light, quick and super easy way to both use and transport. I feel as though I have more energy and most noticeable of all, my digestion is much better (I feel less bloated after meals). Heading into Autumn/Winter and therefore cold and flu season I want to do all I can to give my immune system the support it needs to cope with my hectic lifestyle, and despite the weather getting colder I know I will definitely be “Daily Stripping” for a while yet! Head on over to the Inner Me website to not only find the “Daily Strip” that’s right for you, but check out their Blog, Inner Me Women of the Week, Recipes and indeed read all about founder Nikki’s amazing story about how and why she created Inner Me.